Clay brick with imprint, "Don't Spit on Sidewalk." These bricks were the brainchild of Dr. Samuel Crumbine of Dodge City, Kansas, who served as Secretary of the Kansas State Board of Health from 1904 to 1924. Crumbine was concerned with the spread of disease and fought for sanitary conditions. 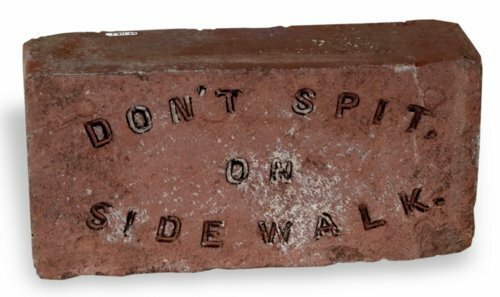 The Capital City Vitrified Brick and Paving Company of Topeka was apparently the first company to create the "Don't Spit" bricks. The Coffeyville Vitrified Brick and Paving Company and others followed.